SATURDAY, OCTOBER 12, 2019 11 a.m.–3 p.m. Admission is $10 per person for adults and children ages 3 and up. Children ages 2 and under are free. Bring your wings for a day of magic! Follow a trail of fairy houses along enchanted forest paths, hunt for gnomes in the Funshine Garden, and join in a meadow maypole dance. Natural materials will be on hand for making an array of magical crafts. Shimmering face painting, archery, a dragon tram, and magical games are part of the fun. Don't forget your camera for photos with the Fairy Court! Live entertainment includes performances by Shore Shakespeare and the Sammati Dance Troupe of Caroline County. Unicorn rides by Snapdragon Stables, fairy accessories, and refreshments—including ice cream from Nice Farms Creamery—will be available for an additional fee. 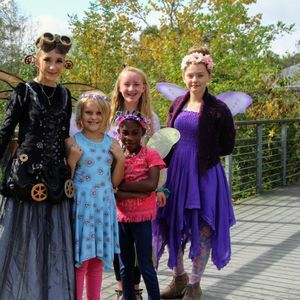 Fairyfest is generously sponsored in part by Ampersand.